A highly potent herb that is aimed at the nutritional maintenance of the dog's musculo-skeletal system and in particular the inflammatory response. 'No Ake!' There are times when our GET OVER! herb mix is just 'not enough' for dogs experiencing acute stiffness of the joints or are perhaps getting over an injury. This is when 'No Ake' should be used. The tiny daily dose can be added to the dog's dinner on a continuous or ad-hoc basis. It is extremely effective and can provide that extra bit of help - without the need for steroids or pricey alternatives AND it won't upset the dog's tummy. Provided in a 100g foil pouch. Review: Used this with our collie girl who is an active agility dog after she sustained an injury. It enabled us to wean down the vet prescribed drugs much more quickly than expected. Very impressed! Review: We're looking after my mums old bichon and he's over done the exercise, he couldn't walk so we sprinkled No Ake on his treats, within an hour he was up walking about. Amazing!! 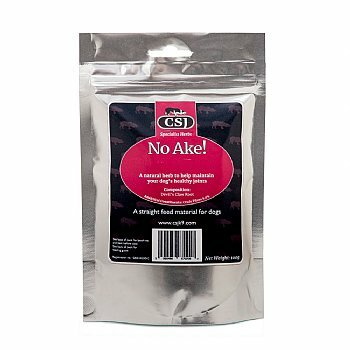 "Five stars for this product"
Review: NO Ake gave immediate relief to my lame Whippet. She had obviously pulled a muscle and was very lame for a week. I tried this and after the first scoop her limp was much improved. After two days it was gone ! I was sceptical this would work but it was immediately effective and I would really recommend it as nothing else has ever helped with the repeated knocks my Whippets pick up whilst running. Amazing product ! Review: Unfortunately my rather young collie (2yrs) has bad hips and as a result was extremely stiff after exercise. Vet initially said to minimise exercise-nope, collie with limited exercise = nutter!! I was recommended no ake by a lady off a dog forum and have never looked back. My baby girl is back doing what she loves...running, playing ball, and walking for hours with very little to no negative impact. I use a combination of csj salmon oil, no ake.